He is the son of Jouichirou Yukihira and, until it closed, worked at his father's restaurant, Restaurant Yukihira. As one of the main protagonist in the manga, Soma fight his odds in the elite school to becoming the best chef in the world even with strong background discrimination of his academy. He is currently a student at Tootsuki Culinary Academy and a resident of Polar Star Dormitory. Souma is a rather energetic child who has the constant drive to move forward with his cooking, mostly due to his rivalry with his father. Due to his drive to move forward Soma is willing to try odd things with food including "Grilled Squid Tentacles Dressed in Peanut Butter," though these dishes usually don't go over too well. 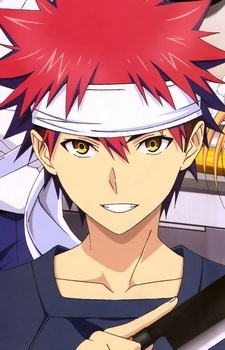 It is because the will of Soma to try to move forward, his dish often considered as creative and innovative by some peers and lecturers; lead his rivalry with all the students in the Tootsuki Culinary Academy even rough. Through all this Soma maintains a laid back attitude towards just about everything but cooking. Soma can cook many different foods in many different styles, though he prefers what he calls "Yukihira Style," which is the cooking style which he learned from his father. Soma shows an immense capability for cooking and a special adaption with learning from his mistakes and improvising through learning from said mistakes. It is due to his creativity and also resourcefulness, Soma is able to create the same dish with different ways of cooking that would create even . Unlike most student whom used lavish ingredient, Soma didn't care about the classes of the ingredient which claimed that neither expensive ingredients nor classy background nor fancy technique made the food better, is the wise usage and alternatives made the food interesting and the customer's satisfaction about the food matters. Further more, he also claimed that undefeated food in just the looks and taste in regal made him bored, which the boredom would made the chef stop improvise their food. To eliminate such boredom, Soma would continued to search different style of cooking around the world in order to improvised his cooking skills.